Far from the image of a luxury plaything, the Chris-Craft Catalina 29 centre console has blue-ocean appeal and fishing features aplenty. 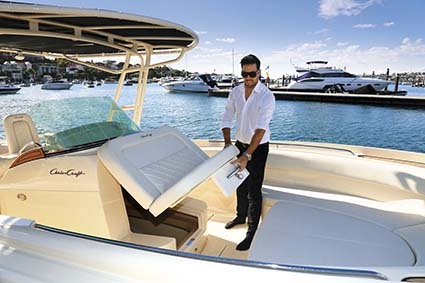 As an-all round sportsboat the Chris-Craft Catalina 29 centre console is a real winner. It has the panache and exclusivity to entertain up to 10 guests in style, with room to move around the separate living spaces at the bow and stern. Behind the Chris-Craft boat legend is a history going back more than 100 years to a time of innovative timber boats. It’s a brand that has been at the forefront of design and racing technology through its life and it clearly embraces a hint of retro styling across the range, even if the boats are now built from fibreglass. Under the killer looks, and the real basis of the Chris-Craft’s quality build, is a hand-built boat with a meticulously applied gelcoat outside a protective vinylester layer and hand-laid woven matt. This is laid to very specific tolerances to ensure correct weight and strength. Centre cab fishing boats by their nature need to be great sea boats and the Christ-Craft Catalina 29 has the DNA to carry off the task. 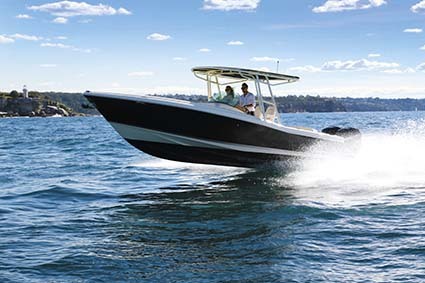 From a sharp entry, the hull’s variable deadrise meets the transom at a credible 21 degrees, all perfect for cleanly cutting through the ocean. Deep chines assist stability at rest and combine with running strakes for better lift. Above the waterline a wide, flared bow sends spray clear of the boat. Deep sides finished in a striking dark grey with a silver bootline, run back to the familiar Chris-Craft tumblehome. At nearly 30ft in length the Catalina looks imposing from the side, the twin 300hp Mercury Verados and the smooth lines of the T-top adding to the impression. The Catalina 29 centre console design offers Chris-Craft buyers a variation to the more usual cabin layouts, with open deck space for entertaining and watersports. Forward of the console is a bow area set up for relaxing. A large lounge converts to a sunpad and at the touch of a button, an Italian-made Besenzoni table lifts on a hydraulic ram for dining. There is room for five on the comfortable dual-density foam cushions, with a double seat moulded into the front of the console for additional guests. The upholstery is finished in a rich cream Silvertex vinyl and blends perfectly with teak accents surrounding the anchor well and elsewhere, while quilting on the seat backs adds an extra touch of refinement. Lifting the seat on front of the console reveals a large doorway with steps down to a roomy head complete with Tecma electric flush toilet, a stylish vanity and showerhead. There’s also access to the electrical fuse panel and batteries and to remind everyone this is a fishing boat, a set of tackle drawers. It’s worth noting that the electrical harness is custom-built in one complete unit from tinned copper wire that has its purpose identified every 50mm. Back outside are wide walkways either side of the centre console, with a low rail and padded coamings following the sweep of the gunwales that wide enough to sit on. Behind the helm is a fold-up teak table. I would be loath to suggest it would make a great bait preparation area as, I’m sure, it would be more suitable as a place to lie out some canapés when the fishing is quiet. For a more serious fishing package there is the option here of a livewell and bait preparation area with sink. Twin Mercury Verados rated at 300hp apiece are an upgrade from the standard Mercury 250s. 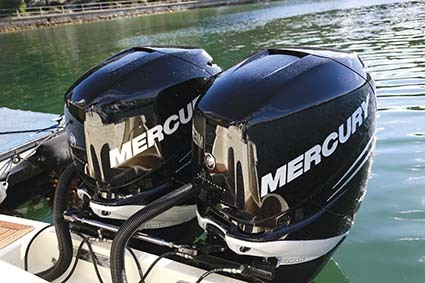 These in-line six-cylinder outboard engines have been in production for 10 years but are still the only readily available supercharged outboards, with the Mercury Verado 300 the most powerful in the range. The supercharger delivers increased power from a lightweight 2600cc engine and as we were to see, impressive torque across the range. There is no doubt that with 600hp on the back the Catalina 29 would perform well. I slipped the electronic throttles into silent engagement and it was no surprise that the hull effortlessly rose out of the hole with hardly any bow lift and quickly settled into a slow cruise of 22kts at 3500rpm. Another 500 revs gave us 27kts and at such a speed across the harbour and into swell around the heads, the hull performed with silky smoothness and an incredibly soft ride into the sea. Acceleration was instantaneous, with only a quick blatt of the throttles sending us clear of the gentle swell. Heading wider, the sea was picking up under an 18kt southerly and the short chop made going a little less comfortable. In these sloppy conditions 22kts was safe to maintain and with a total fuel usage of 56lt/h for both motors, a run to the shelf is not going to break the bank. The 833lt of fuel under the floor will give a safe range of nearly 300nm at this speed. Back on the harbour where the water was relatively calm, we were able to give the engines a better workout.Low and mid-range acceleration is blisteringly fast, the Catalina 29 rocketing from 27kts at 4000rpm to 40kts at 5500rpm. Wide open throttle indicated 48.5kts on the GPS – or just on 56mph in old money. At this speed the boat feels stable and safe with no sign of flightiness or vagueness in the steering. It handles smoothly and stays reasonably flat with bucket loads of power out of turns. 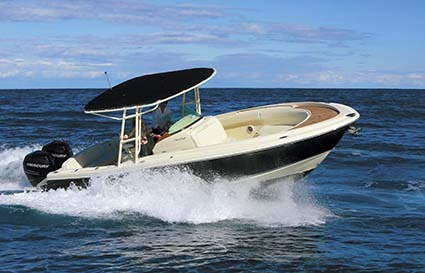 As an all-round sportsboat the Catalina 29 is a real winner. It has the panache and exclusivity to entertain up to 10 guests in style, with room to move around the separate living spaces at the bow and stern. For serious fishing the Catalina 29 as tested almost has too many creature comforts to blood big fish without a guilty conscience. It is, of course, possible to order it configured however the buyer likes, to create their perfect mix of entertaining and fishing. 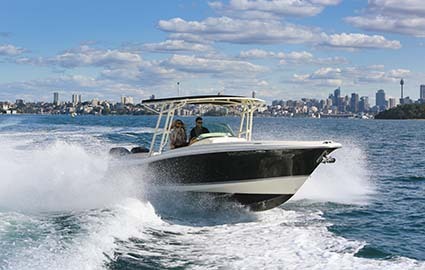 Prices for boating on one of the world’s best start at $257,000 with 250hp engines, while the boat as tested is listed at $279,000 with options including the bow sunpad and table, sports T-top, windlass and Tecma head. * Sea-trial data supplied by the author. Fuel burn is per engine. See the full version of this review in Trade-A-Boat #241, June / July 2014. Why not subscribe today?